Here's an Operation Christmas Child shoebox my aunt packed for a 2-4 year old boy this year. This shoebox was 360 inches cubed, for comparison, a GO box is 306 inches cubed, so it's pretty close in size. 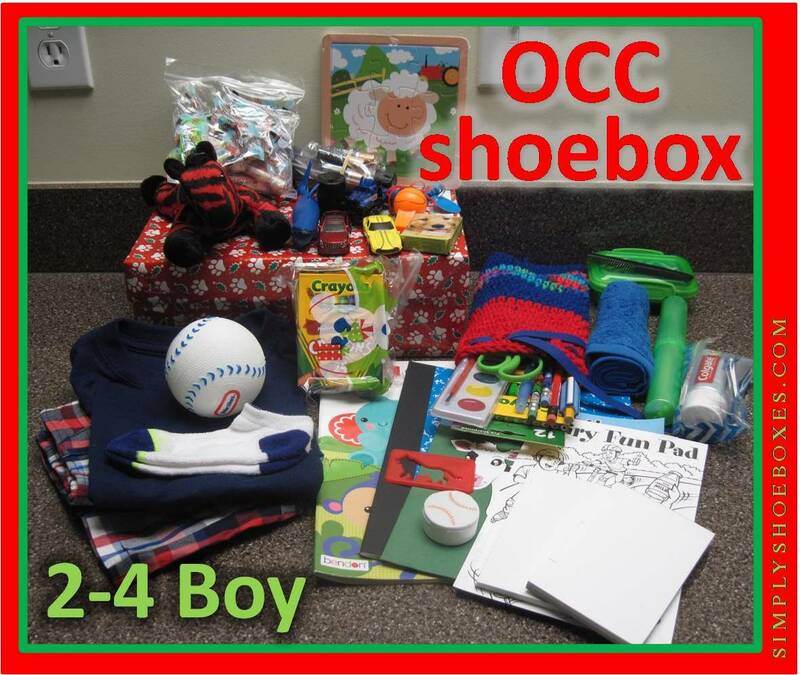 Here's one of the 2-4 boy OCC shoeboxes she packed in 2015. If you'd like ideas for other ages be sure to check out my posts on boxes from this year for: Girl 2-4 years, Girl 5-9, Boy 5-9, Girl 10-14, & Boy 10-14. NOTE: Different countries have different restrictions on what can be packed in a shoebox due to customs, and this is the last year for candy & toothpaste from the USA. Be sure to check the guidelines from your national organization before packing! School and art supplies went in the pencil cases which stood up on the side, the puzzle and paper pads went flat on the bottom. Then more goodies went in. Then more items went in, you can see the hard/square soap case and crayons box went next to each other to minimize wasted space. Then other softer items folded in the other open area. Finally, the coloring & composition book were laid on the top, slightly curved ( as they were too large to lay totally flat in the box. You can see details of exactly how to do this in this post: How to Fit a Full Sized Notebook or Coloring Book in an Operation Christmas Child Shoebox. Check out more of our Operation Christmas Child shoeboxes for 2 to 4 year olds.